Amy Edelstein is a powerful communicator of ideas that can transform ourselves and the culture we live in. In 2014, she established the Inner Strength Foundation, which has trained over 5500 teens in Philadelphia high schools to work with the tools of mindfulness and systemic thinking and realize their higher potentials. She is the recipient of the 2019 Philadelphia Social Innovators Silver Award for ISF’s work in Anti Violence. 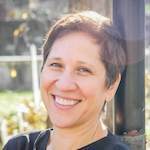 Amy has thirty-five years experience with contemplative practice and is author of several books including award-winning The Conscious Classroom.